On the 21st (Tue), explore the world behind art at Rijksmuseum, admire the masterpieces at Van Gogh Museum, and then take an in-depth tour of Anne Frank House. To see reviews, where to stay, traveler tips, and tourist information, read our Amsterdam online sightseeing planner . San Diego, USA to Amsterdam is an approximately 15.5-hour flight. You can also do a combination of train and flight; or do a combination of flight and train. The time zone difference when traveling from San Diego to Amsterdam is 9 hours. Expect a bit cooler temperatures when traveling from San Diego in May; daily highs in Amsterdam reach 63°F and lows reach 48°F. Cap off your sightseeing on the 21st (Tue) early enough to travel to Rome. On the 22nd (Wed), get to know the fascinating history of Piazza Navona, admire the landmark architecture of Pantheon, ponder the design of Trevi Fountain, then delve into the distant past at Palatine Hill, and finally explore the ancient world of Colosseum. To find where to stay, other places to visit, traveler tips, and other tourist information, use the Rome trip planner . Traveling by flight from Amsterdam to Rome takes 5.5 hours. Alternatively, you can do a combination of flight and train; or drive. Prepare for somewhat warmer weather when traveling from Amsterdam in May: high temperatures in Rome hover around 75°F and lows are around 58°F. Wrap up your sightseeing on the 22nd (Wed) to allow time to travel to Barcelona. On the 23rd (Thu), take in the architecture and atmosphere at Barcelona Cathedral, admire the landmark architecture of Basilica of the Sagrada Familia, then walk around Parc Guell, and finally appreciate the history behind Casa Batllo. For photos, traveler tips, other places to visit, and more tourist information, read Barcelona trip itinerary planning website . Fly from Rome to Barcelona in 5.5 hours. Alternatively, you can drive; or take a train. In May, plan for daily highs up to 71°F, and evening lows to 57°F. Wrap up your sightseeing on the 23rd (Thu) early enough to travel to Paris. Start off your visit on the 24th (Fri): admire the masterpieces at Louvre Museum, admire the landmark architecture of Arc de Triomphe, and then admire the landmark architecture of Basilique du Sacre-Coeur de Montmartre. On the next day, contemplate the long history of Eiffel Tower, then admire the masterpieces at Musee d'Orsay, and then take in the architecture and atmosphere at Cathédrale Notre-Dame de Paris. For reviews, other places to visit, ratings, and tourist information, you can read our Paris trip planner . Fly from Barcelona to Paris in 5 hours. Alternatively, you can do a combination of train and flight; or drive. 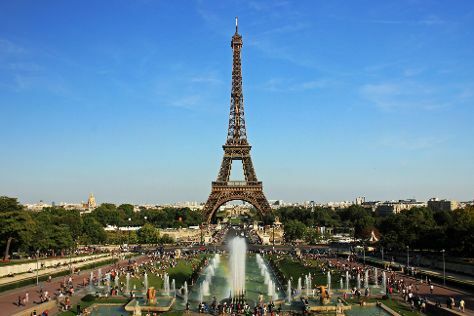 In May, Paris is a bit cooler than Barcelona - with highs of 64°F and lows of 49°F. Wrap up your sightseeing on the 25th (Sat) to allow time to take a train to London. On the 26th (Sun), steep yourself in history at Buckingham Palace, stroll around St. James's Park, then get a sense of history and politics at Houses of Parliament, and finally admire the masterpieces at National Gallery. Get ready for a full day of sightseeing on the next day: take in the architecture and atmosphere at St. Paul's Cathedral, then take in the views from Tower Bridge, then admire the striking features of Westminster Abbey, and finally make a trip to Coca-Cola London Eye. To see traveler tips, photos, where to stay, and more tourist information, you can read our London visit planner. Traveling by train from Paris to London takes 2.5 hours. Alternatively, you can fly; or drive. Traveling from Paris to London, you'll gain 1 hour due to the time zone difference. In May in London, expect temperatures between 62°F during the day and 46°F at night. Finish your sightseeing early on the 27th (Mon) so you can travel back home.